Currently, as I’m writing this, there are small but prominent traces of snow on the ground. But I’m not too mad about it. I know spring is right around the corner and it’s been teasing us Midwesterners for a while now, but it’s nearly here. But I almost would like it to take a bit more time getting here because I need more time to plan out my wardrobe for the spring! I’m feeling very inspired, refreshed and more clear about what my style is and what pieces I want to incorporate. And something about the spring and warm weather, especially after being bundled up under cloudy skies for several months, makes me want to jump out and try new things. So before I jump back into the thrift stores and vintage shops and start looking around and putting together outfits, I figured I’d show you the process of how I’m building my spring wardrobe. It’s still very trial and error, but I’m definitely more organized and oriented than I was last year. Planning out your wardrobe each season may not be for everyone, and I definitely was hesitant about it at first, but I’m learning that I personally definitely need some kind of planning. Mainly because it really helps when I go hunting in thrift stores to have a clear vision and list of what I need, what i want, and most importantly what I can get for less than half of the price at other mainstream stores. This doesn’t mean that if i see something at a store - thrifted or not — that really excites me and isn’t on my wardrobe list that I won’t get it. I feel like the world capsule is just a bit too scary and committing — for me all I need is a plan, a blueprint let’s say. Next, I try to the best of my ability to write out just a couple things that I imagine in my head, or from a mood board, that I specifically want. And that’s pretty much the way I’ve been going about building my spring/warm weather wardrobe. It’s very small, and I’m not going all out and cutting out half of my clothing or taking inventory of every single thing, but it’s helping to be more aware of what I have and what I want my closet to look like. Lastly, I couldn’t help but share some of my favorite trends that I’ve archived in my mood boards that I’m very excited about rocking this spring. Some I already have pieces from, and others are things still on my spring wishlist. Slime green, salad greens, all the greens! That’s definitely the color of spring this year and I’m ready to embrace it. This is a color that although I never really had anything against, is not really seen much in my closet for some reason. Last year I thrifted a pair of simple gingham salad green pants and I’m still finding the courage to wear them, I mean, they’re green! Why is that such a scary color? I’ve realized that it’s only scary if it’s a certain type of green, and it’s in a piece of clothing that we usually associated with being a more neutral color, like pants. My dad was an avid cyclist. He once rode 15 European countries and use his bike to get around every part of Cleveland whenever he got the chance. He definitely raised me on this. I remember him specifically not being a fan of people wearing full bicycle outfits though, he thought unless you were racing somewhere, it’s really not necessary and just makes it look silly. So when I first saw the emergence of bicycle shorts emerging as a street style trend, I couldn’t believe it. I could’n’t believe how silly it was and then I couldn’t believe how much I loved it. It’s absolutely genius, and I’m pretty sure it’s my new favorite “athleisure’ trend for the spring and summer because it’s so easy to style in different casual and statement ways. 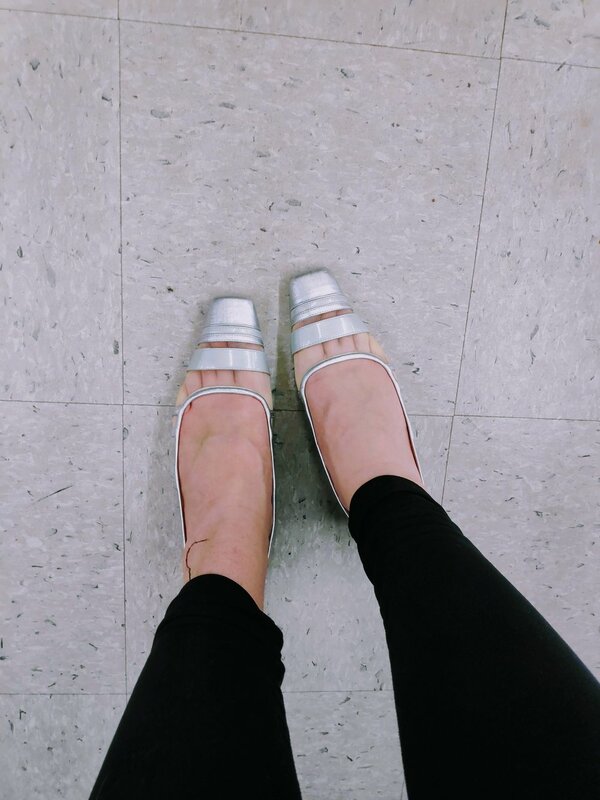 Behold, a pair of beautiful sea-through pumps that I found at my local thrift store…that I had to say hello and goodbye to because they were too big. But now I’m on the hunt of something similar. I think it’s time to be more clear with what I want. In life, in fashion, in relationships — everything. So maybe it’s the perfect symbolism that has drawn me to the trend of see-through fashion. Or maybe because it’ just too fun not to explore. I’m in love with the see-through trend. It’s airy, it’s bright, it’s brave. And I think it’s perfect for spring and summer. Less is more, right?